A brand new year always brings with it new possibilities in our lives and the hope of potential new treatments for DMD. But, as Gus’ mom, I just see one more year that has passed without a cure – one year closer to him losing the ability to walk, to use his hands, to hug us, and eventually, to breathe. A new year carries with it the same bittersweet quality as each of Gus’ birthdays. We throw a big party for him and he loves it. We make him whatever he wants for dinner, and get him a new “Wildlife Ecologist” toy, but underneath it all, our hearts break because we know what age brings for a boy with DMD. Even as he insisted on sledding alone, resulting in one crash into a tree and one complete flip over, Steve tried to always stay by his side, invisible, but there. Steve knew and I know that he probably shouldn’t be sledding at all. The steroids he takes can cause his bones to be brittle. But, while he can still walk, how can we deny him this little bit of normalcy? Clearly, this was all much harder on Steve than Gus. Gus is used to being a little slower and trying a little harder. He came home saying that he had a great time. But even that is heartbreaking; it’s only a matter of time before sledding will be a thing of the past for him. I asked Gus that night if sledding was hard for him. He responded, “Not really, why?” I said, “Well, because your muscular dystrophy sometimes makes it hard to walk up the hill, doesn’t it?” He gave me the most incredulous look and then he snickered, “Why are you talking about THAT, Mommy?” In his mind, it was just a normal day. What we wouldn’t give to stop time right now. Of course I explained that it would only be for a short time. But the panic in my heart and mind was intense. How will we ever explain to him that Duchenne muscular dystrophy will also take these skills away from him and he will never get them back? How can we celebrate the New Year and new opportunities and growth, when our son has a progressive and deadly disease? But we do. We do it for him…and for our other children…and for ourselves, really. Because it is impossible to push forward if we continually think about what the future holds. We constantly walk the tightrope between being hopeful that we might find a cure or effective treatment, and being in denial. Maybe this is the year when everything changes. Happy New Year – and please hug your healthy children close and be thankful! “It will help us know if Gus is progressing,” his teacher said innocently. There was a long pause. Every parent of a child with Duchenne muscular dystrophy remembers the moment they heard the diagnosis. Inevitably they asked, “What can we do?” The simple and unthinkable answer? “Nothing.” When we first hear it, however, most of us don’t understand how profound that ‘nothing’ is. A Duchenne patient cannot exercise to get stronger. He can’t “work harder to battle the disease…” It won’t “get better with time.” Nothing we expect is true. We are raised to believe that we can surmount any obstacle if we work hard enough. The challenge of this diagnosis is that ‘working,’ in the way we often think of it, speeds the disease. One of Gus’ doctors tells the story of a dad who was in the Marines. He was in denial about his son’s illness and insisted on exercising his son’s muscles – unable to accept the idea that exercise would not make his boy stronger. We all know the end of that story: Through exercise the dad actually accelerated the muscle degeneration and, by implication, brought on his own son’s death sooner. That harsh, upside down and backwards truth impacts every moment that we spend with our sons. When I’m asked how Gus is doing these days, I often respond, “OK, but I’ve noticed that he is really starting to struggle going up steps.” In one sense, I am excited and happy that he can still climb up steps; on the other hand, I hate it every time he does it because I know that every trip up and down is further damaging his muscles. Birthdays may be the most obvious example of this. We celebrate the fact that we’ve been blessed with another year with Gus, and we mourn the fact that another of the too few precious years that Gus will be alive has passed. A friend of mine once said of his DMD boy, “It’s as if my son is a perfect ice sculpture of himself and I desperately want to stop him from melting…” We both knew, however, to complete the metaphor, that we can’t simply put our sons on ice – they are boys who want to play in the sun. We let them, and find joy in their vibrancy and life. They are magic, like Frosty the Snowman. And like that mythical character, they won’t be held back. “And he said, let’s run and we’ll have some fun now before I melt away…” So we watch our sons melt because we love them too much not to let them. Gus’ well-meaning teacher simply didn’t understand. In the world of DMD, the words “conventional progress” make no sense. In fact, when it comes to DMD, the only ‘progress’ we can depend upon is the steady ‘progress’ of the disease – which is no progress at all. It is, of course, the exact opposite, the ongoing regression of a boy’s physical abilities. It may be that hard reality – coupled with the fact that our boys can’t work to stop this disease, that we, their parents, their community, are driven to work so hard. As I have often said at fund-raisers, our boys keep us up at night and get us up in the morning. We create foundations, hold fundraisers and collaborate. We write letters, lobby the FDA, meet with scientists and try through it all to be the best parents we can be. At the beginning of this month, The Duchenne Alliance, an international collaboration of DMD focused foundations (www.duchennealliance.org) , has declared June, “Duchenne Awareness Month.” Through awareness and the increased funding that will inevitably follow, we know that we’ll help scientists right the upside down world of DMD. Science is close, very close – clinical trials are in process for promising meds and more meds are in the pipeline. In the end, though, it is about money and political pressure. It is about us, the parents finding vibrancy and energy and excitement and the subsequent funding that will continue to move this research forward. But our time is short. At 8 years old, it is possible that my son has just ten years. We are in a race against time – the Duchenne Alliance’s motto is United to Beat Time. We are challenging the nonsense world of DMD with what seems an equally impossible premise – that we can beat time and save our boys. We will do it, and when we do, progress will mean progress for our children, goals will be possible and we all can dream of their full lives ahead. The leaders of Duchenne non-profit organizations agreed at a meeting last week on the mass implementation of the DUCHENNE DASHBOARD, an innovative research grant management system that will facilitate an unprecedented level of collaboration among the many foundations, patient advocacy groups, and scientists dedicated to finding treatments and cures for Duchenne. Duchenne is the most common and lethal genetic disease diagnosed in childhood. There are currently no life extending treatment options for the over 300,000 males worldwide living with the condition, which usually limits life expectancy to the mid 20s. The Duchenne Dashboard provides scientists and foundations with a single entry point for proposals to advance Duchenne research. Scientists can use the dashboard to securely submit their projects and member foundations and their scientific advisors can consider and give feedback on them instantly. The tool also enables foundations to quickly collaborate and contribute funds to promising projects. “The Duchenne Dashboard is going to radically improve and expedite the scientific process in the field of Muscular Dystrophy. The non-profit foundations came together and set the new standard for effective biomedical funding,” said Duchenne Dashboard creator Carlo Rago of OpenOnward. “The platform is now available to all neuromuscular foundations aiming to conquer disease,” he said. The Duchenne Alliance was formed last year to promote better collaboration among the many non-profit organizations around the world committed to conquering Duchenne and improving the lives of those living with this progressive and debilitating muscle wasting condition. “The primary goal of the Alliance is to quickly identify, understand, fund, and implement the most promising research,” said Steve Dreher of the Duchenne non-profit Hope for Gus. “The fastest way to success is shared knowledge and collaborative funding,” she said. About the Duchenne Alliance: We are an alliance of independent Duchenne organizations dedicated to advancing our missions to improve quality of life, care, and treatment of those affected by Duchenne. Our goals will be achieved by building trust, sharing knowledge, leveraging resources, and streamlining business practices. Each organization will be held to achieve their own mission as we collectively serve the entire Duchenne community. Please visitwww.duchennealliance.org. About OpenOnward: We employ open science solutions that empower individuals, groups and societies. Our core products were developed to expedite the entire scientific process by facilitating deeper, more meaningful connections between scientists and society. Our team consists of leaders in biomedical research and open science. We are dedicated to the greater good. Find us on the web at www.openonward.org. It was a mere 5 months ago that I promised to write again soon – seems like only yesterday. But, Duchenne Muscular Dystrophy is a balancing act, and we ended up on one side of the see-saw. We spent the last few months taking care of Gus – we bought a new house – one that’s better for him (not perfect,but better). There are far fewer stairs and a flat lot. While it seems like yesterday when I promised to write, the actual yesterday was Gus’ birthday. He turned 6 and I had to write in honor of that. ANYWAY, the moment was sweet, even if it was fleeting. We climbed onto the ‘tractor’ and drove down to the ‘pond.’ Then we mowed for a bit and Gus steered – making S-curves all over the lawn. When Gus got tired of that, he said he wanted to read a story – we went inside and snuggled under a blanket on the couch. Tonya got home with the other two kids, and we made Gus’ chosen dinner. We moved to the ice-cream cake, Gus opened presents and loved every minute of it. It was perfect, a day full of moments that will become precious memories to be tucked away and treasured forever. Gus turned 6 yesterday and his disease reminded me that each of those memorable moments are rare and shimmering and beautiful. At the same time, it wouldn’t let me forget that they are also far too fleeting. That’s the balancing act. This disease, Duchenne Muscular Dystrophy DEMANDS that you be aware of EVERY moment because those moments won’t last. At the same time, it has you forever vigilant about what’s next. It won’t allow you to be satisfied unless you are doing something to change the impending future. “At night I lay down next to you sometimes I can’t believe that someday all of this may change – your eyes, your smile, your innocence, the way you laugh the way you dance, I want to hold back time just to keep you safe. And that summarizes it. How do we love this moment fully and then just let it go? How do we give our boys with DMD a life’s worth of love in every moment? How do we somehow use that love and devotion to make us stronger when we know that it makes us more vulnerable? How do we live full lives with our boys and, at the same time, be full-time advocates for them? In the end, I think, we shelter their dreams. We deeply believe that those dreams are far more precious than memories but we live our lives honoring both. 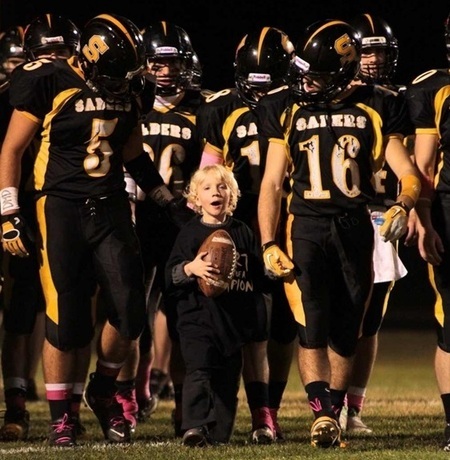 I am writing in response to the Souhegan Saber football team’s game on October 7th that served as a fund-raiser for the Hope for Gus Foundation. It’s nearly impossible to express the feelings I have for my son Gus, who was diagnosed with Duchenne Muscular Dystrophy (DMD), two years ago. DMD is currently considered a terminal illness – it is the worst form of muscular dystrophy. The diagnosis means that Gus will be confined to a wheelchair before his adolescence, and eventually lose his ability to breathe on his own. Boys with DMD typically die of heart failure in their mid-twenties. It is hard to resolve that reality when spending time with six year old Gus today. He is vibrant and alive, full of the sort energy and love of life that only young children can have. How does a father understand and accept such a diagnosis? The only wisdom I have gained in the two years since Gus’ was diagnosed is that I cannot do it alone – and yet, as a teacher, I have tried to keep it separate from my students. Somehow admitting that level of vulnerability seemed too much. Yet I have learned that when your child has a terminal illness, that vulnerability is there for all to see. The Spirit of Souhegan – rooted in the communities of Amherst and Mont Vernon – was on full display in the week leading up to the fundraiser. Students approached me in the hall to say that they were happy to have something really good to work for. Through advisory, they gathered pledges for each touchdown our Saber’s would score against Pembroke Academy’s Spartans. They bought tee-shirts and contributed spare change. They attended the game in record numbers. I have so many impressions from the evening of the game. In the locker room before the game, Coach Beliveau handed me a check from the Pembroke team for $175.00, underscoring the spirit of sportsmanship. He told his players that by raising awareness and money, the team had already ‘won.’ The team presented Gus with a ball signed by all its members and a t-shirt that said “Heart of a Champion.” Students lined the path applauding wildly as team captain Chris Chinnis carried Gus with the team out to the field. As the starters were being announced, someone asked Gus if he wanted to be carried or if he wanted to run with them onto the field. 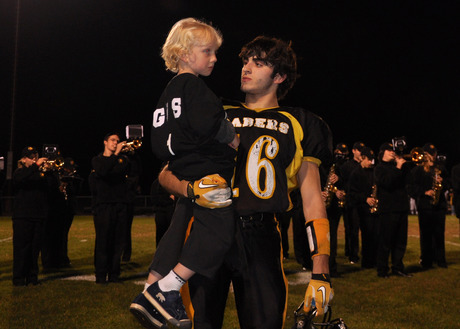 He said, “I want to walk.” Without pause, the young men shouted, “We’re walking tonight – walking with Gus!” Gus went out with the captains for the coin toss, called it and won! During half-time, the team stood with Gus as the Harte family generously presented Gus with a football signed by Patriot’s quarterback Tom Brady. The pledges are still being counted, but as of this writing, the Sabers’ seven touchdowns have raised close to $8000.00 for the Hope for Gus Foundation. As a fundraiser, I am grateful for money that will have an important, immediate, and direct application in exciting research. As I told my students, researchers are close to figuring this disease out – the money that we raised really matters. As a dad, I am proud of my son for inspiring our students. But I am writing this letter as a member of the Souhegan community and a teacher of students in Amherst and Mont Vernon. I am writing to share with the general public the knowledge that this community is filled with a sense of wanting to participate in the greater good. This community of students, staff, administrators, and parents truly want to change the future. This school community is caring and compassionate. Through the leadership of the Souhegan Saber football team, we all participated in paying it forward and providing hope. My family and I are deeply touched by your generosity of spirit. Hope for Gus is happy to support this promising research and so proud of the Duchenne Alliance for working together to make this happen!